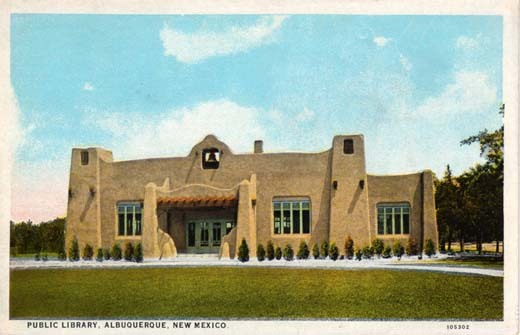 The Special Collections Library of the Public Library houses research collections on Albuquerque history and New Mexico history and culture. The 1925 Pueblo/Spanish Revival-style building is a registered Albuquerque landmark in the historic Huning Highlands neighborhood. The research collections are available for in house use only. Route #66 Central Ave. Plan your trip here. Rapid Ride 766/Red Line and 777/Green Line buses stop near Special Collections Library by request. Take Interstate 25 to the Martin Luther King Jr Drive exit. Go west on MLK towards downtown. The first traffic signal west of the Albuquerque Regional Medical Center (formerly St Joseph's Hospital) is Edith Blvd. Turn left onto Edith and go south two blocks. Take Central Avenue to Edith Blvd NE. There is a traffic signal at the intersection. Parking along the west side of Edith is metered. Meters can be paid with coins or credit cards. The fee is $1.00 per hour, with a four-hour limit, enforced from 8:00 a.m. to 6:00 p.m. Monday through Saturday. There is no charge for vehicles with disability permits. The appropriate placard must be displayed. Free parking is available for green vehicles registered with the City of Albuquerque's Parking Registration. On-street parking in the neighborhood is by permit only between 8:00 a.m. and 5:00 p.m. seven days a week. Library customers are advised to pay close attention to parking signs and curb markings. Special Collections has three meeting rooms available for use by the public when not in use by the Library System. Botts Hall is an auditorium that seats over 100 people. The Center for the Book can seat up to 30 people. The New Mexicana Room has a capacity of 15. To inquire about the rooms please stop by the information desk or call 848-1376. Policy, rules and required forms for using the meeting room may be found at Meeting and Study Rooms as well as a list of meeting rooms at other branches. To view availability and begin the booking process, see our online booking form. The Center for the Book is located in the Special Collections Library, part of the Public Library. Volunteer docents lead field trips to teach about the history of writing and books. 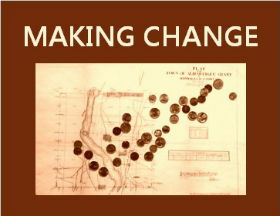 Making Change is an ongoing series about the businesses, people, and projects that formed Albuquerque as we know it today. 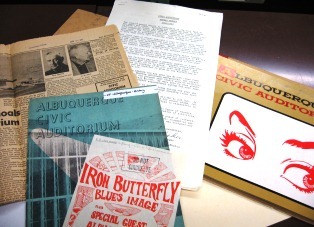 Presented at Special Collections by the Public Library, Historic Albuquerque, Inc., and Oasis Albuquerque. Take a tour of Albuquerque's oldest public library. 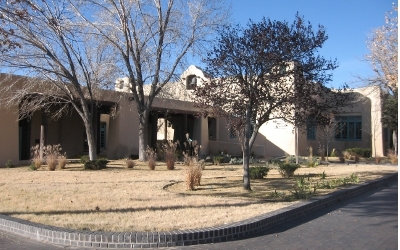 The Special Collections Library houses research collections on Albuquerque history and New Mexico history and culture. The 1925 Pueblo/Spanish Revival-style building is a registered Albuquerque landmark in the historic Huning Highlands neighborhood. Our monthly tours are on the 4th Saturday of each month at 11:00 a.m.. You are also welcome to call us at 505-848-1376 or to email us to schedule a tour if the regularly scheduled tour is not convenient. Our research collections include everything from popular treatments of ghosts and aliens to scholarly publications on history, anthropology, archaeology, religion, language and art in Albuquerque, New Mexico, and the greater southwest. 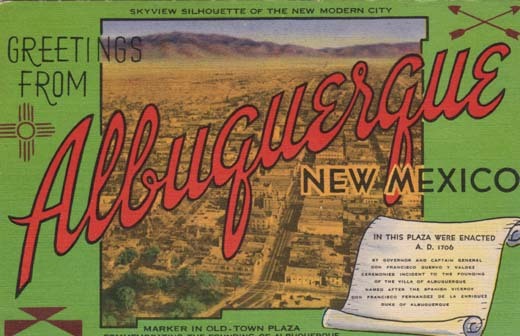 Although the primary focus is on the greater Albuquerque and Bernalillo County area, excellent resources for researching the pre-Entrada, Spanish Colonial, Mexican, Territorial, and Statehood eras of New Mexico and the greater southwest are readily available. Special Collections presents speakers on local history topics on the second Saturday of the month from 10:30 a.m. to 12:00 p.m. The current series is Making Change. Explore the history of the written word at the Center for the Book. Visitors are welcome to visit and explore independently, and staff can assist with scheduling a tour or a field trip. The web-pages at this link provide access to many of the digitized resources of the Public Library, research tools from Special Collections, and overviews of many of the items that can be found at Special Collections.